In years past, we've published an "eLearning Trends for 201x" post, detailing the trends we're seeing in the elearning and LMS space. This year we're approaching the subject differently and instead focus below on trends we have seen develop over our past 15 years of providing elearning solutions to businesses in the skilled trades. Manufacturers and distributors typically deal with an increasingly-integrated technology stack with a sometimes bewildering set of acronyms, including PRMs, HCMs, LCMs, SCMS, and ERPs, just to name a few. Training and company touchpoints can happen anywhere in this tech stack - and managing all of it, along with in-person training, lunch-and-learns, product demos, hands-on-training, apprenticeship programs, and more, is integral to the company's overall learning strategy. Whereas "Blended Learning" used to mean incorporating both instructor-led training (ILT) with e-courses, now the term has evolved to mean the merging of all learning touchpoints for the company into a fully-integrated learning solution. Using AR technology as part of practical learning application is a big trend that we are seeing grow, especially amongst manufacturers in the skilled trades. It shortens time to competency and increases the ability of the employee to apply knowledge immediately. AR still has a long way to go but the technology opens the door to multiple applications in the workplace. Learning system providers are shifting to provide support and integration of this new technology. 2018 brings another big wave of Baby Boomer retirements - and businesses, especially in the skilled trades, are struggling to replace that knowledgable workforce at the same rate. In order to attract Millennials to these jobs, not just having - but also actively promoting - their robust digital workplace training program is high on the list of priorities for distributors. Since Millennials not only expect that their first job will offer training, but also say that jobs that offer comprehensive personal development and training programs are more attractive, distributors marketing their open positions with an emphasis on training programs and career development will see an increase in quality of applicants. With so much learning content out there, it can be easy to get lost in everything. The rise of user-generated content (or, learner-generated content) helps pave the way for learning programs to be applicable and specific to job responsibilities. Some companies are opening up their content libraries to their learner employees who are subject matter experts, and allowing them to create content that is specific and actionable for other employees. Learning content does not have to be perfect - even a short video captured quickly on a smart phone will do as a way to capture expertise on the job (and ensure the retention of tribal knowledge with your retiring employees). One of the primary goals of manufacturers is to drive brand familiarity with their end users - which is proven to influence purchasing decisions and recommendations of a specific brand. Since there a number of professional certifications that are required in skilled trades industries (for example, in the electrical industry with ongoing state certification requirements), this provides the opportunity for manufacturers to get their products in front of hundreds of thousands of end users. Woven seamlessly into the certification courses, product placement and brand features are a great way for a manufacturer to improve their reach and increase their brand exposure. 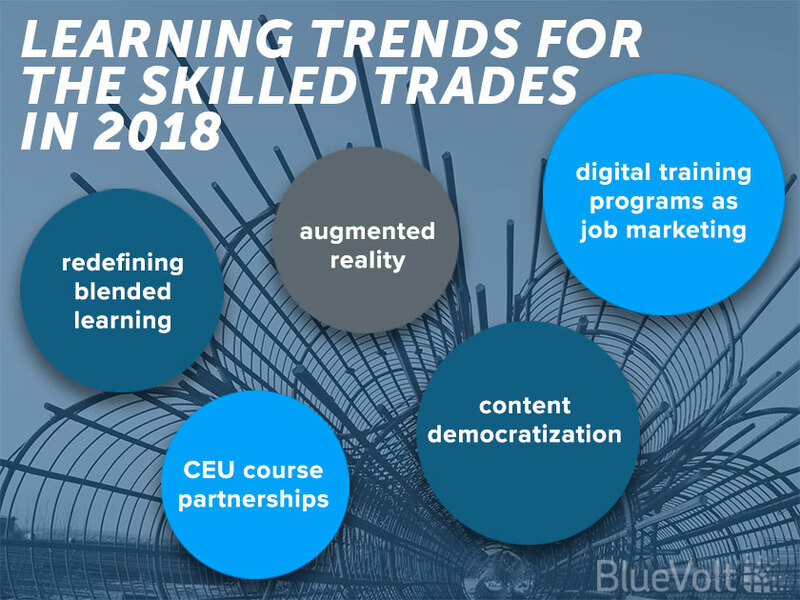 These are just 5 of the top learning trends we're seeing in the skilled trades as we begin a new year. By staying aware of trends in one's industry, one can uncover potential opportunities to leverage learning programs for business success. Learn how we can help you succeed today.